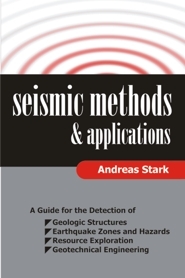 This book has been written for those who need a solid understanding of the seismic exploration method without difficult mathematics. It is presented in a format that allows one to naturally progress from the underlying physical principles to the actual seismic method. The mathematics needed for the subject is kept as simple as possible; students only need high school physics and mathematics to thoroughly grasp the principles covered. Dr. Stark has developed this text and honed its content with feedback from hundreds of students over nearly two decades of teaching seismic exploration geophysics. This textbook will teach students the principles for the detection of geologic structures, earthquake zones and hazards, resource exploration, and geotechnical engineering. This title is Winner of 2009 Text and Academic Authors Association "Textbook Excellence Award"
Andreas Stark is a Professional Consultant Geophysicist who has over forty years of practical exploration experience, including working as a seismic instrument engineer and observer in the field, processing seismic data, performing research programming in signal analysis, and over 26 years of active exploration and development geophysics in both technical and managerial positions. Dr. Stark also has extensive experience with teaching the geo-sciences. He has a B.S. in Pure Mathematics, an M.S. in Applied Geologic Sciences and a Ph.D. in Business from Rushmore University.